“Kazakhstani school students will have an opportunity to know more about the history of the World’s Fair” commented the Kazakh TV in one of their latest news (KazTV, 2014). 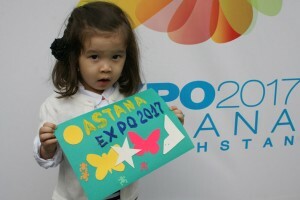 A new textbook titled “Future Starts Today: Astana EXPO-2017” was presented in Astana in October 20, 2014. The book, developed by experienced Kazakhstani teachers, tells the history of the EXPO in a simple and engaging way. The authors of this book predict that the textbook will be useful for both, classroom and extracurricular activities, and at the lessons of history and geography. There is a chapter in the book which is dedicated to Astana. The unicity of the book is that the textbook has lesson plans, including seminars, round tables, travel-lessons, contests and even competitions. The published 1,000 copies of the textbook are available both in the Kazakh and Russian languages.​ They will be distributed between the Astana schools. Schools of other cities of Kazakhstan will receive the electronic version of the textbook. The Kazakhstani educators worked out the lessons on the history of the World’s Fair in order to raise awareness on EXPO-2017 international exhibition not only among the schoolchildren but also among the population of the country. The textbook, which is highly estimated by International Exhibition Bureau, was prepared jointly with the Department of Education of Astana (Mukanov, 2014). In fact, the Department of Education of Astana has been conducting a lot of explanatory work among the city schools urging them to organize various internal activities and science fairs devoted to the topic of the EXPO 2017. The exhibition topic of “Energy of the Future” chosen by the country takes into consideration the importance of energy and environment issues. The topic will extensively cover the energy saving problems and the implementation of alternative energy sources (Syzdykova & Abilov, 2013). On the whole, schools understand the significance of Kazakhstan’s hosting the EXPO-2017, which will foster the integration of the country into the globalized world and improve its international image. Hopefully, every student educated in such schools will promote the further development of Kazakhstan by getting acquainted with the history, traditions and culture of other participating countries. That in turn, will extend Kazakhstan’s international, economic, political, scientific and cultural ties. EXPO-2017 is not only the great opportunity for Kazakhstan to make a contribution to the growth of global technical interaction but also the possibility for the current problems solution worldwide. Syzdykova, E. Z. & Abilov, D. K. (2013). EXPO-2017 as an area for solution of current problems of science and education. International Journal of Experimental Education 12 , 13-14.